Easy Vegetarian Minestrone Soup w/ Pasta & Kale – a quick and easy veggie loaded soup using pantry and freezer staples. On your table in just about 30 minutes! This Vegetarian Minestrone Soup is a super easy comforting meal that can be on your table in just about 30 minutes. I’ve used pantry and freezer staples for a minimum amount of fuss. Adding the noodles makes it a dish your kids will be happy to slurp down as well. They have nutritional value at least equal to, if not greater than, fresh veggies. They’re always ready for you. You can certainly use all fresh veggies if you want, but why do all that chopping when frozen veggies have just as many nutrients as fresh (in some cases, they have more), and they are so much quicker? Frozen veggies are picked at their peak ripeness and frozen right away maintaining all of their nutritional value. Fresh veggies are often shipped hundreds or thousands of miles to get to your grocery store, losing nutritional value with each day they sit out. Even if you buy fresh veggies from your local farmers market, the longer they sit on your counter or in your fridge, they lose nutrients. I always have several bags of frozen mixed vegetables in my freezer for meals such as this. Don’t get me wrong, I LOVE fresh veggies and in most cases fresh is superior in taste and texture. BUT you really can’t tell the difference in soups and stews, so let’s give ourselves a break and take the easy route today, ok? 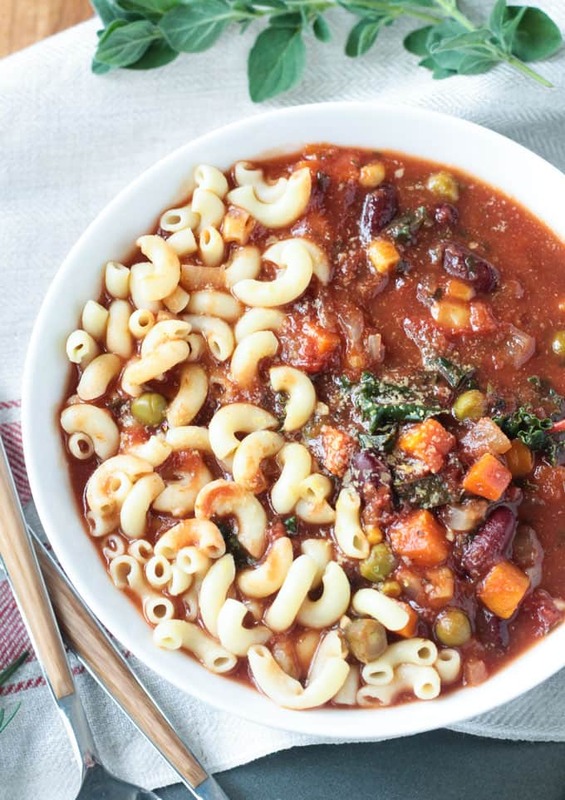 If you’re trying to cut down on your meat consumption or just add more vegetables into your meal plans, this Easy Vegetarian Minestrone Soup is a great place to start. It’s hearty and filling with the beans and pasta, making it a meal that will please the whole family. It’s one of my kids’ favorite soups! It also makes great leftovers the next day. Pack it up in a thermos for a cozy warm-you-up lunch at work or school. 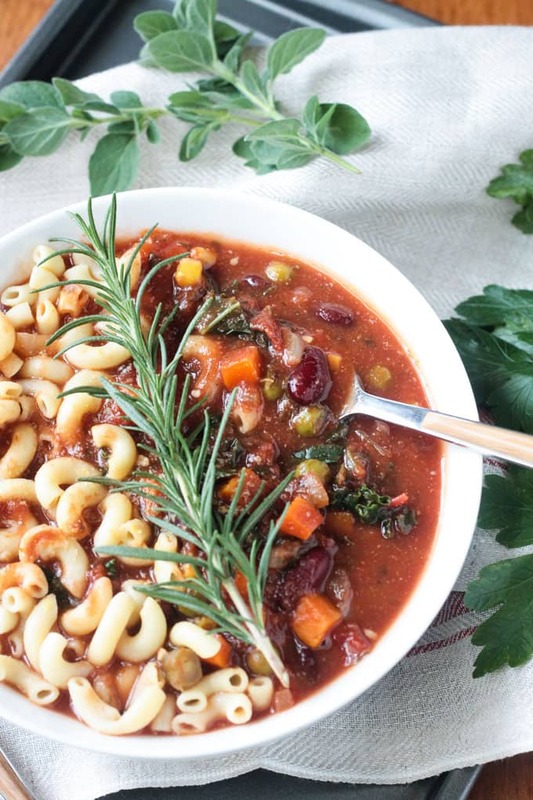 I hope you love this Easy Vegetarian Minestrone Soup as much as we do. If you try it, please come back and leave me a comment below with your feedback. You can also find me on social media. Be sure to tag @veggie_inspired and #veggieinspired so I’m sure to see it. Enjoy! A quick and easy veggie loaded soup made from pantry and freezer staples. On your table in just about 30 minutes. Add frozen veggies, crushed tomatoes, the rest of the carton of veggie broth, parsley, oregano, thyme, salt and pepper. Simmer 20 minutes to allow veggies to become tender and the flavors to mingle. Add kidney beans, kale, and noodles, and simmer another 2-3 minutes to warm through. Take off heat. Add optional nutritional yeast, if using, and stir. *This is a great use for leftover noodles. I’m not quite ready to admit summer is over…it’s a denial I have and considering we are still in summer weather over here, I don’t blame me. But this sounds amazing and definitely need to file it away for when I’m ready to come to terms with fall. The temps actually spiked back up here too. It’s in the 80’s all weekend and upper 70’s for the entire next week. I had already embraced fall – the leaves are changing and falling and the temps were in the 50’s-60’s, so this warmer weather has me a little unhappy. The only thing I don’t like about fall is how quickly winter follows it! Minestrone is such an awesome soup to make, especially when you’re short on time but still want something nutritious. I bet that kale in their takes it up a notch too. We usually throw spinach in ours but the kale would make it a little heartier and great for those cooler months. Thanks, Nicole. It’s definitely a hearty soup. I love it all year, but totally perfect for fall and winter. 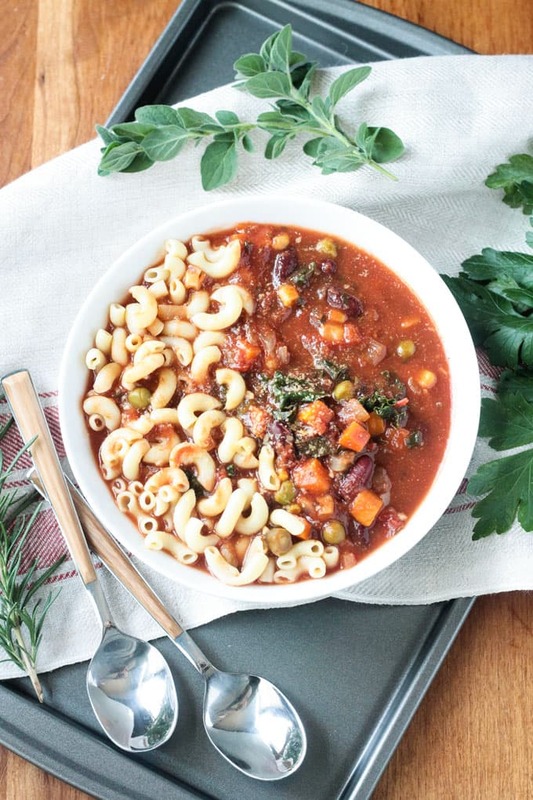 Now that is one delicious and hearty looking minestrone. My kids would love to dig into a big bowl of that. Pinning it now so I don’t forget to make it! Thank you, Vanessa! I think our families have very similar tastes! Hope you all love it! All those lovely veggies! I love minestrone. it’s so flavourful and I like the filling pasta in it. It’s much more satisfying because of that. I wish I had a bowl right now! The pasta definitely turns it into a meal! Thanks, Mel! Yaaassss!!! 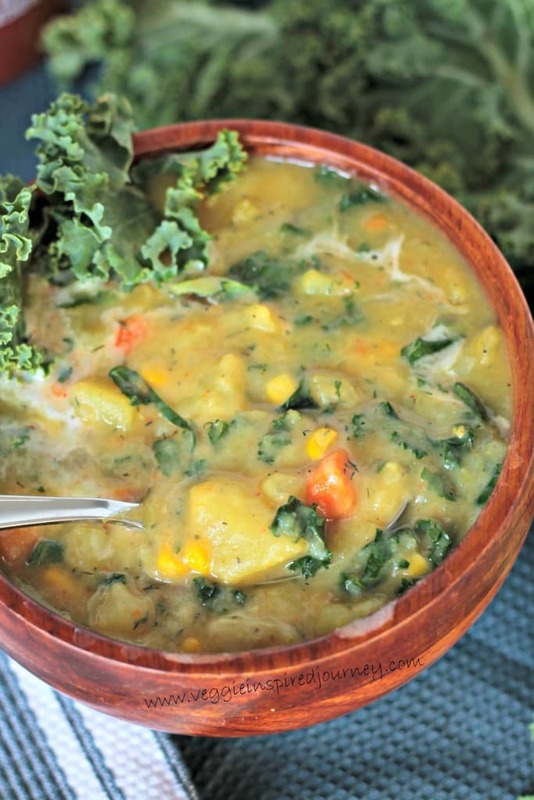 Love adding kale to soup like this! So tasty! This is a must make. Thank you, Julie! I hope you love it! Vegetarian or not you will love this! This looks so good! Yes! I totally agree! This soups is for everyone! Thanks, Kristina! 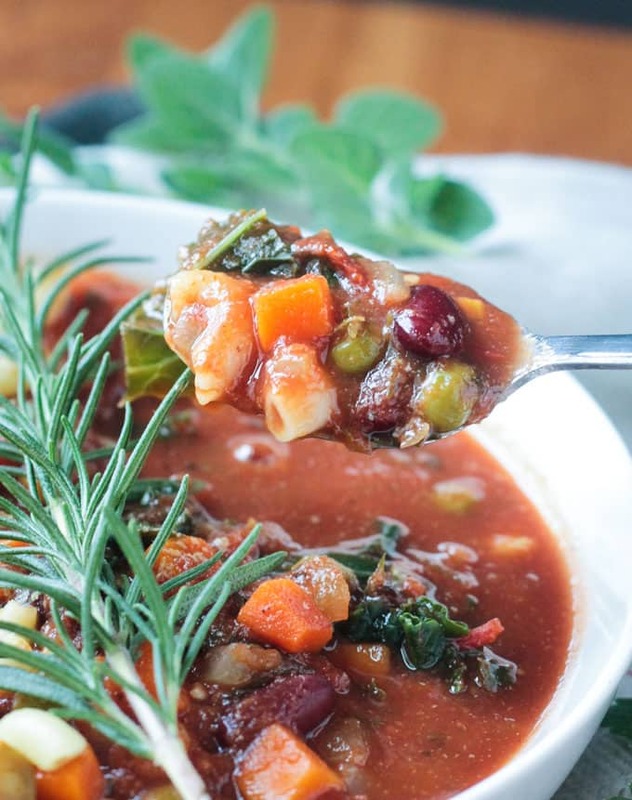 You have to love minestrone soup, especially when it’s as easy to make as yours. I totally agree with you about using frozen veggies. They’re fine in soups and they retain more nutrients when they’re flash frozen. Thanks, Linda! I’m so excited for soup season! What a wonderful comforting meal! Love the little addition of nooch – often that’s all you need to really add some umami. I agree. I don’t love nooch is big doses, but a little goes a long way and it just adds that little extra something. Thanks, Alisa! One of the best comfort dishes! Looks perfect. Wish I had a bowl right now! You and me both! Need to make another pot! Thanks, Aimee! Yum! I could really go for this right now. Sounds so perfect for fall! Thanks, Christine! Soup season is on! Looks so good! I just finished a big bowl of kitchari and I am craving all the comfort foods and soups right now with the cooler temps. It’s a great way to use up veggies from our garden too! Yes, gotta use up those garden veggies before the frost gets to them! This looks so cozy and delicious—perfect for fall! I’m with you on the frozen veggies! They work perfectly in soups and totally nutritious! Yes, they’re so easy and taste just as good in soups and stews. Thanks, Steph! Just wondering if you have tried cooking the noodles in the soup? I have not as I almost always have leftover noodles that I use for this. I would guess that you’d need more liquid if you’re going to try that. Let me know how it turns out! Way to set the record straight on frozen veggies – they get a bad rap! This soup sounds delicious – a perfect meatless Monday meal! They do, right? Fresh is great, but really why do all that work if frozen works just as well in certain recipes? Thanks, Whitney! Yes! I’m so happy soup season is back! This looks so good and it’s so easy. I’ll have to add it to my growing list of soups to make. Thanks! I could eat soup every day – I have a long list too! 🙂 Enjoy, Deryn. Thanks! Minestrone always reminds me of my grandpa!! And frozen veggies are always a win! Aww, love that! I was just in the kitchen chopping celery and was thinking of my paternal Grandmother. For some reason the smell of celery gets me thinking of her every time! I’m usually not a soup person, because they’re just not filling enough for me, but this soup looks so hearty and comforting – it would definitely fill me up! I totally get it. I’m a hearty soup person too. I do love brothy soups too, but usually as a meal starter. These loaded soups are my fave and the ones I reach for time and time again! OoOOo yes bring on soup season! 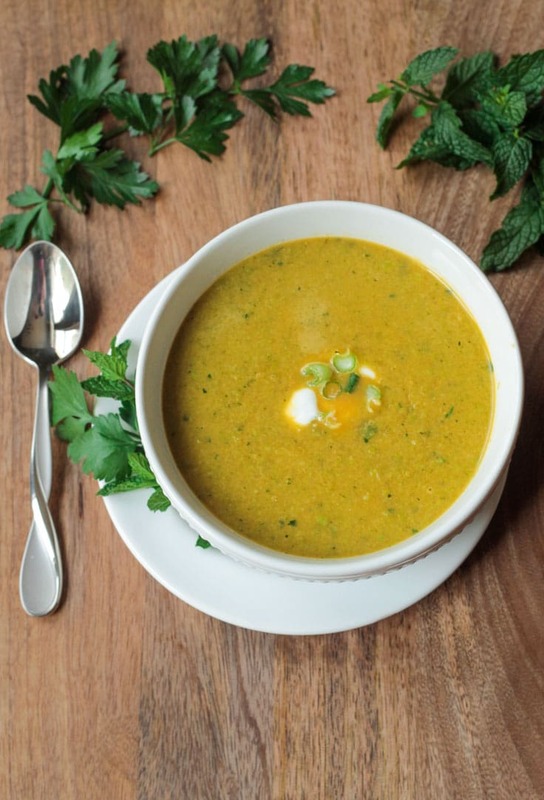 Especially a soup with so many delicious and nutritious ingredients! Fall is my fave and I’m sooo ready for soup season! I LOVE minestrone soup. It’s so easy and filling! And I love how if you don’t have an ingredient, you can easily sub in minestrone soups. Yours looks amazing and very hearty! Yes, they are super versatile! Thanks, Rachel! How fabulous. This looks like a wonderful medley of flavours. So warming and nurturing as the colder weather starts to creep in. Wonderful inspiration. Thank you, Trinity! I love a cozy bowl of soup as the weather turns.